I’m in the middle of rewriting the original draft of Book 2 (Blood Rites), and I’ve decided to introduce several minor characters that provide an entrance for a very important main character. It’s always interesting as a writer to provide color and context to historical fiction, and this new collection of characters provides that in huge letters. 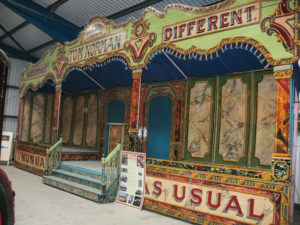 I’m talking about Tom Norman, aka ‘The Silver King’ and his traveling sideshow. 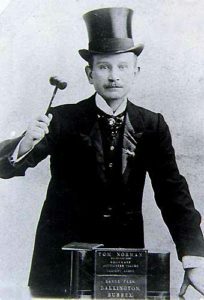 Norman is often portrayed in film as a middle-aged to older man with a wine-soaked paunch and a sour face, but in truth he was only 28 years old at the time of Book 2 (November 1888). Norman was an actor and quite handsome, and his letters and personal memoirs seem to indicate a disposition inclined toward fair settlement for his performers rather than abuse. Of course, that is debatable, for Frederick Treves’s account of Norman is pretty much the opposite. Treves, you may recall is the London Hospital surgeon who took in Joseph Merrick after seeing him exhibited by Norman. I’ll not get into the Norman/Merrick/Treves debate here, but suffice it to say that Merrick–as with most of those displayed by the many ‘showmen’ in both England and America–probably lived a life far different from most in this world. So, why have I decided to include the sideshow as part of this book? Partly, because it was an integral part of the east end and lower class entertainments, but also because it connects to a spiritual character, one hinted at in Book One but not formally introduced. I’ve placed the sideshow encampment near Hackney Marshes and an old settlement once owned by the Templars. In short, the plot thickens.